Today marked the 11th year (4,035+ days) of featuring a different daily chocolate. 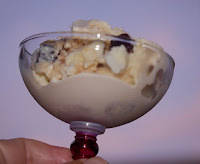 The occasion was celebrated at dawn this morning with a new chocolate item, before a hike in the redwoods. Have I run out of new chocolate items to try? Not even close. The last few weeks have included some of the hottest days on record in the Bay Area. Perfect time for some frozen chocolate and caramel items, such as this one. 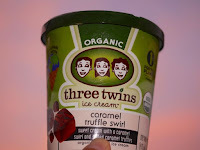 Three Twins (Petaluma, CA) is one of my favorite brands of ice cream. Their Madagascar Vanilla, Dad's Cardamom and other flavors have been wonderful. Traditionally the company's ice cream flavors have contained a short list of quality ingredients without vegetable gums, stabilizers and emulsifiers which many consumers have gotten used to. Long may this tradition continue. Today's organic Caramel Truffle ice cream (vanilla ice cream base with a caramel swirl) included a mix-in of tiny chocolate caramel "truffles." I think I would have preferred flecks of dark or milk chocolate and salted caramel, but the micro peanut butter* cup-shaped truffles were cute. 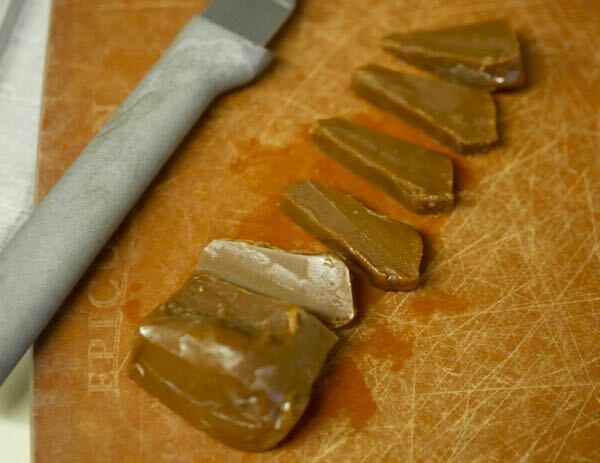 I also enjoyed a few slices of buttery, rich, homemade, caramel on the side. *There were no peanut butter ingredients in this ice cream.